Poet and educator Chris Martin visits the KXCI studios to read poems from and talk about his work with Unrestricted Interest, a writing program and small press that specializes in working with and publishing the work of nontraditional learners, especially students on the autism spectrum. Featuring the music of Seu Jorge, Kadhja Bonnet, and Childish Gambino. Meghana and Chetan Junnuru |“May” and “Papa,” The Divine Maze, Unrestricted Editions, 2018. Farid Matuk|“If what etches in your eyes…” The Real Horse, University of Arizona Press. 2018. 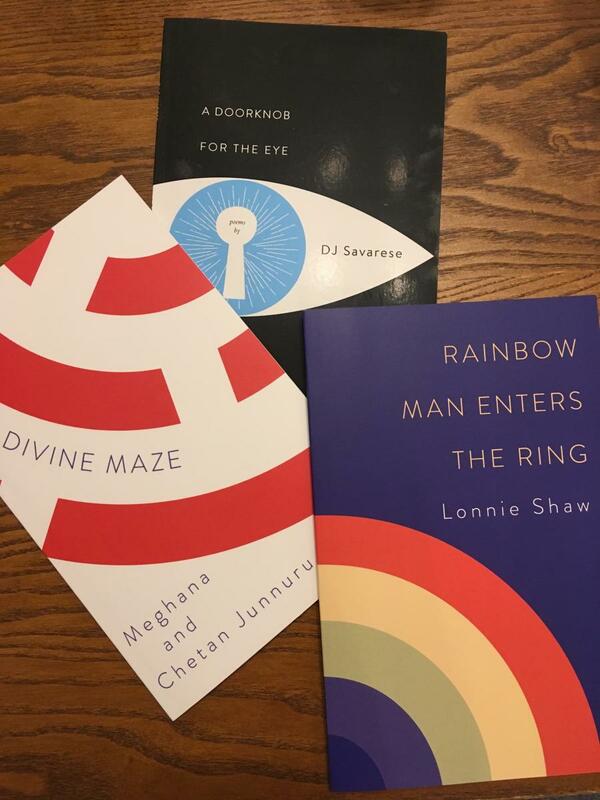 Lonnie Shaw |“Feeling Rich” Rainbow Man Enters the Ring, Unrestricted Editions, 2018.
giovanni singleton |“C is the Color of Attention or Abecedarianism’s Architecture,” American Letters: Works on Paper, Canarium Books, 2018. DJ Savarese |“The Librarian in the Trees” A Doorknob for the Eye, Unrestricted Editions, 2017. Nanni Balestrini | Excerpt from “Blackout” Blackout, Commune Editions, 2017. Wells Denison | “13 Ways to Look at a Ghost,” Ghostly Poems, Unrestricted Editions, 2017. Will Corkins | “Courteney Cox,” Bikinis and Cocoons, Unrestricted Editions, 2016. Chris Martin is the author of three books of poetry and is the co-founder of Unrestricted Interest, an organization dedicated to transforming the lives of people with autism through poetry. His first collection of poems, American Music (Copper Canyon Press, 2007) was selected by C. D. Wright for the Hayden Carruth Award and his newest collection, The Falling Down Dance (Coffee House Press, 2015) received the 2016 MIBA’s Booksellers Choice Award for poetry. He has been a Writer-in-Residence at the Minnesota History Center and United World College and has received literature fellowships from the National Endowment for the Arts and Minnesota State Arts Board. In addition to his work with Unrestricted Interest, he teaches at Carleton College and Hamline University. Martin visited the University of Arizona Poetry Center this summer. You can read about his work and his students here. SPEEDWAY & SWAN is a monthly, one-hour free-format radio program that presents contemporary poetry against a context of variously compatible and offbeat musical selections. Culling from the exceptional libraries of her partners, the University of Arizona Poetry Center and KXCI 91.3 Tucson Community Radio, host Susan Briante is joined in conversation each episode by a rotating guest co-host who brings to the hour a selection of poetry from his or her personal canon, which, along with the freshest and best from the "new shelves," they read live. Susan Briante’s most recent book The Market Wonders (Ahsahta Press) was a finalist for the National Poetry Series. The Kenyon Review calls it “masterful at every turn.” She is also the author of the poetry collections Pioneers in the Study of Motion and Utopia Minus (an Academy of American Poets Notable Book of 2011), both from Ahsahta Press. Briante has received grants and awards from the Atlantic Monthly, the MacDowell Colony, the Academy of American Poets, the Dorothy Sargent Rosenberg Memorial Fund and the US-Mexico Fund for Culture. She is an associate professor of creative writing and literature at the University of Arizona.